Most of us like to think of ourselves as young: young in heart at least, if not actually young in years. But is it possible to stay “forever young” in terms of health and wellness? Of course, probably no one would want to remain forever young in terms of life experience. Our experiences give us character and contribute to our growth and development as persons. As we get older, though, gaining skills and possibly wisdom, is it really necessary to suffer physical breakdowns along the way? Holding on to youthful bloom may not be feasible in all aspects, but there are a few critical tips and tricks to retain much of that glow and vigor as we get older. We may not, in reality, stay forever young, but we sure can give meaning to the notions that “50 is the new 30” and “60 is the new 40”. Here are two key tips. They may seem obvious, but the power is in actually implementing these tips consistently over time. You get fit by doing the work. Not all at once of course, but gradually, steadily, building up strength and endurance, starting right where you are. The secret is to begin. And after not too long a time, you’ll find that your new habit of exercise is providing all kinds of surprising benefits, including deeper, more restful sleep and increased energy and exuberance. Not to mention weight loss and a slimmer waistline. These two tips, eating less and exercising more, have been known for decades. But in order to reap the many benefits, what’s required is to actually do these things. We can be forever young, relatively literally, by taking these simple actions on our own behalf. Expressing and Living Life to the Fullest! Today I was thinking of how many of my friends–offline and online–don’t understand chiropractic, let alone my passion for it. I get it, as there are many mixed messages out there, including “chiropractors” who try to practice in a medical model treating back pain (we call these people medipractors). I can see from their perspective it is hard to know what to believe. Let me share with you what I believe. Our spine is the connection between our brain and body. It carries all the vital messages between the two, allowing our central nervous system to perceive our environment and adapt to it. These messages, when properly conducted, allow us to express life, to grow, and to learn. The spine also regulates the tension in your central nervous system. If you live in a state of chronic tension, then you throw your entire nervous system out of balance. Unfortunately this abnormal tension often goes undetected, but it is disturbing your ability to live to your fullest. When perception of the environment has become distorted, your brain can no longer properly control your body’s response to that environment. This communication breakdown interferes with your body’s ability to heal and adapt… the messages sent through the spine are garbled, like watching a static-y old antenna TV. Your brain and body should be communicating in crystal clear 1080p HD. When it’s not, your nervous system is not learning, growing, and adapting as it should. Meaning, you are not fully expressing life or experiencing health. What happens when the abnormal tension gets bad enough? 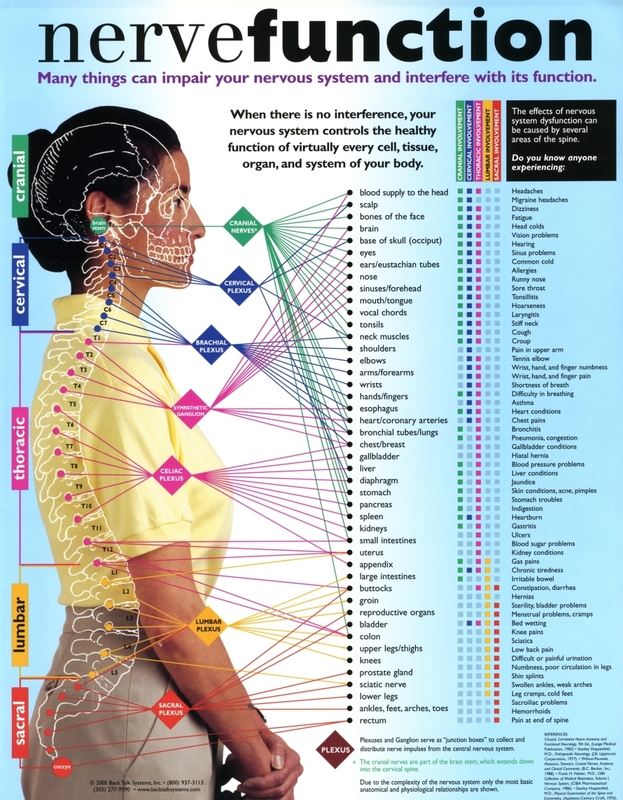 It manifests as what we call “symptoms.” Headaches, back pain, allergies, inability to focus, low energy, etc… (see the nerve function chart above). These signs are your body’s way of letting you know there is a failure to adapt and it needs help. The only thing that chiropractic does is release abnormal tension and re-establish communication so you can live to your fullest and naturally heal on your own. That is why I am so passionate about chiropractic. It empowers people to be their best and brightest while experiencing a lifetime of health. I can think of nothing greater. I hope and pray that you do.